Samsung isn't great at keeping secrets. After we told you about the specs of the 2017 Galaxy A phones, their design and announcement date, now we also know their price. 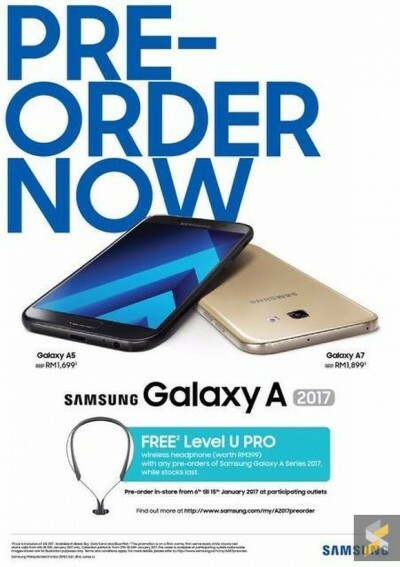 Malaysian department of Samsung has revealed Pre-order prices for Galaxy A5 (2017) and Galaxy A7 (2017) - the first is 1699 RM or almost $380 and the latter is 1899 RM / $425. With any purchase there is also free Level U PRO wireless headphones which otherwise costs 399 RM or about $89. The event is next week and we are waiting to see if Samsung could surprise us or all the information about the forthcoming Galaxy A series is already out of the box. Why OP gotta do us dirty like that? I was one of their earliest fans too. Don't forget better after-sales service, more service centers and warranties, which a lot of cheap China knockoffs can't duplicate.